Well-known for her curious question about chocolate cornets, Izumi Konata is the leader and the shortest of the main characters in the series. She works in a cosplay cafe in Akihabara in order to fund her expensive hobby of collecting manga, anime, and games. She loves to play online games late into the night, which is the reason why she tends to fall asleep in class. I don’t think she ever got the answer to which end of the chocolate cornet is the head. As for me? I’m wondering about Japan’s uniforms; I know they have two sets, one for summer and one for winter, but are they usually two different colors too? Anyway, great job with this cosplay! Thanks to fuffly for sharing! The well-mannered young lady of the Lucky Star group, Takara Miyuki was the class president for her grade level in her first year. She prefers glasses over contact lenses because she’s afraid of putting the lenses into her eyes. Konata often teases her for embodying a large number of moe archetypes. 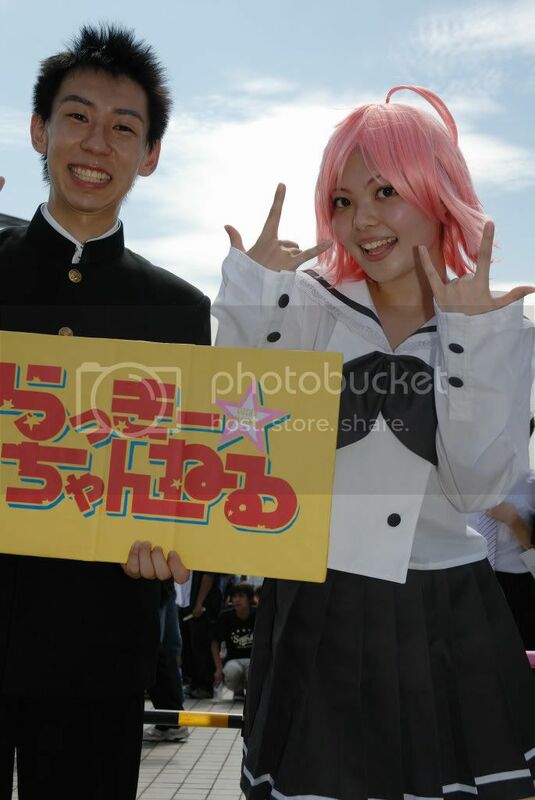 She makes a cute Miyuki, don’t you think? It’s interesting to note that she even colored her eyebrows for this cosplay. Nice work! I love her choice in eye glass frames too. It’s one thing to have a cute cosplayer portrayer the anime character, but how about a cute seiyuu (voice actress) who looks like the cute character? This is Hirano Aya, the seiyuu behind Lucky Star’s Izumi Konata. I’m not entirely sure about the story behind this picture, but you can’t deny her smile looks like Konata’s. Aya is a voice actress and a J-pop singer in Japan. She has had many roles in TV commercials, visual novels, and of course, several anime series. Hello Kitty fans will also recognize her as the voice behind Emily in the 2007 animation film, Hello Kitty: Apple Forest and the Parallel Town. 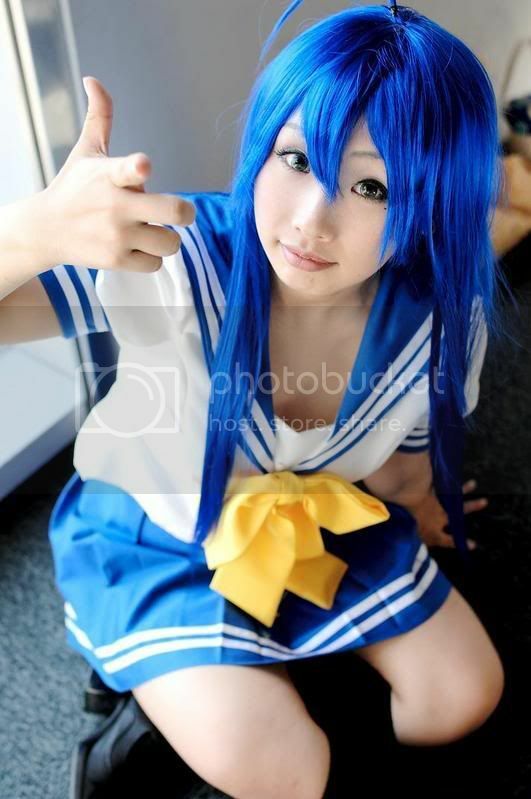 Aya is also the voice behind Suzumiya Haruhi, whom Konata cosplays as in the series. All in all, I’d say Aya is pretty famous in the Otaku (anime fans) circle. In Lucky Star, she even made an appearance in the anime itself, shown in the icon on the left. I think the real Aya is a lot cuter though. The stereotypical otaku (anime lover) character in the series Lucky Star, Izumi Konata is fun loving, athletic girl who prefers her hobbies over studies and sports. Since she needs a lot of money to keep up with the latest anime and manga series, she works part time in a cosplay cafe. Parodies of The Melancholy of Suzumiya Haruhi can be seen in this anime while Kona-chan works in the cafe. In one episode, Konata cosplayed Haruhi and danced the signature ending theme song. Ironic, considering Konata and Haruhi have the same seiyuu (voice actress), Hirano Aya, and yet you wouldn’t have noticed if you don’t read the end credits. Cute cosplay! She got Kona-chan’s expression perfectly. Even that one strand of hair sticking out on top. Nicely done! I’m so sorry for not updating over the holidays… I’ve been quite ill for a while, and no one wants to spend the holidays sick in bed… But that’s how I spent my Christmas. Anyway, I found a bunch of pretty awesome cosplays, and it’s a nice welcome for the new year to post a bunch of them to start of with, right? This is the one I saw that was most amusing. You see, in the anime “Lucky Star”, there’s a special segment at the end of the show called “Lucky Channel”. The girl, Akira, is apparently an idol who can be super cute when she’s in the mood, and a huge pain when she’s mad. Minoru is her assistant, who became more famous than Akira, though this picture makes it look as if he’s trying to get a spot in the limelight! Pretty accurate cosplay! Lucky Star rules! You are currently browsing the archives for the Lucky Star category.